Chances are, women who are experiencing hair loss usually notice their hair getting thinner as an early symptom. Our hair is a major part of our identity, so it’s no shock that hair loss can be emotionally devastating, especially since there are no scientifically proven solutions to completely reverse hair loss. Today, we are here to share different ways of how to cover thinning hair. You can use these bald spot cover up tips in your daily lives. Even though this is not a permanent fix, it can help by creating the appearance of thicker and fuller hair. If you are looking for hair care products to stimulate new hair growth, check out our top list for hair loss shampoos and supplements as well as various essential oils for topical treatments. Think of Hair fibers as a facial foundation that comes in a powder form, but it’s specifically used for hair. It’s made of very fine powder and once you apply it to your thinning spot, it clings to the hair in that area and makes it look thicker. It is perhaps the most convenient way to hide thinning spots. How it works is pretty straightforward: You first need to pick a hair fiber that matches your hair color. There are a number of companies offering hair fibers with different color shades from blonde, dark brown, light brown to pure black. Once you pick the one that matches your natural hair color, sprinkle the product gently over your thinning or balding areas. The active ingredient of the hair fibers starts intertwining with your own hair, which creates a thicker appearance. 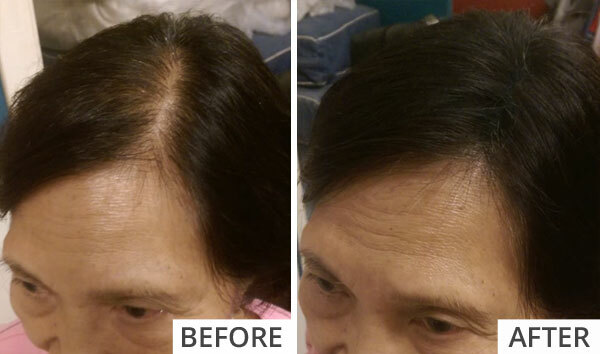 Let’s start with one of the Toppik before and after photos from a woman who is dealing with the most common hair loss problem – thinning hair on top. 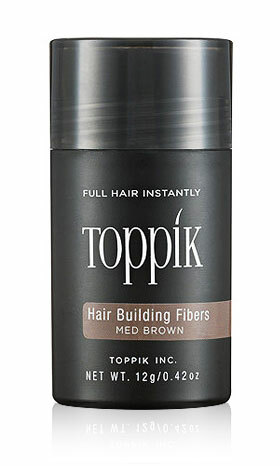 Toppik is the pioneer of hair fibers powder to cover bald spot and has been around quite some time now. There are numerous men and women using Toppik on a daily basis for bald spot cover up. The product is easy to use and does a good job staying in place all day (Click here to see more before and after photos as well as more details about Toppik fibers). Nanogen is another hair fiber brand to consider for covering hair thinning spots from hairline, sides, to crown areas. This hair loss concealer is made of micro-keratin fibers which is the same ingredient as Toppik. Nanogen Hair fibers comes in ten different color shades including gray. We checked some of the video reviews demonstrating before and after using the product on YouTube and noticed Nanogen gives similar results as Toppik. Not surprisingly, there are quite a number of celebrities also using hair fibers like Toppik to give the illusion of thicker hair. Trust me – we are not the only people who are concerned about our hair loss. How you dry your hair makes a huge difference to your hair volume. When you take a shower in the morning, make sure to blow dry your hair by letting it fall to one side. Move your fingers through your hair from the root to the tip while drying it. Once it’s done, pull your hair back and brush it gently using a boar bristle hair brush (A boar brush is strongly recommended for women with thinning hair since it is much more gentle and softer on your scalp). Any hair brush recommendation for fine hair? Related Post: January Jones Experiencing Hair Loss - What Was The Cause? If you feel like splurging, Mason Pearson hair brush is hands-down. 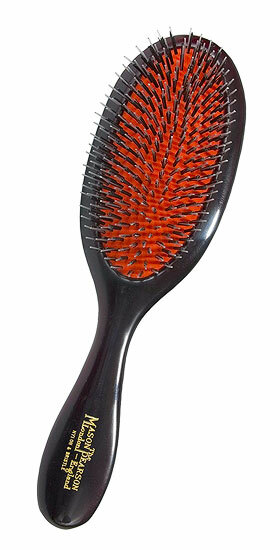 The company has been around for decades and this is the go-to hair brush for numerous celebrities with beautiful hair. If you are on a budget but still want the quality intact, go with this boar bristle brush which is more reasonably priced. 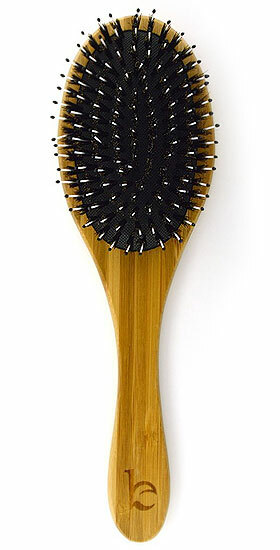 This brush does a great job de-tangling on any fine hair type, creating volume, and feeling really good on the scalp. If you also use hair spray to add more volume to your hair, spray it on your hair from a distance while dangling your hair to the side (We do not recommend using hair spray too often if your hair is thinning). As we all know, excessive use of hair styling products can be toxic to your scalp health and is one of the main causes of hair loss in women. Also instead of hair spray, consider a hair thickening cream that provides multiple benefits for daily use. One of our all-time favorites is this 5-in-1 thickening cream which is an amazing volumizer that also strengthens and conditions your hair at the same time. These are general rules for choosing the right color product to cover thinning hairline: Don’t go dark. If you have very fine or thinning hair, you want a base color that is not too dark. Because the darker it gets, the more you will be able to see the scalp. Also, opt for highlights that is slightly lighter than your natural color. It adds an illusion of more body & volume to your hair strands by providing different shades, texture, and depth to the hair. When it comes to a DIY hair color kit for women with thinning hair, consider this Henna hair color pack which is chemical-free and NO fillers or additives. If you have long but fine hair, ask your hair stylist to add layers to it instead of keeping it all one length. Layers create more volume and add fuller shape to your hair. Even though layers can make some hairstyles unmanageable (with shorter ends going various directions), it’s a great way to add more volume. This is a sensitive subject for all of us. Wigs are sometimes the only option when thinning hair around the temples or on the forehead become too visible. If your hair thinning is severe due to postpartum hair loss, medical conditions, or any other unknown reasons, wigs are a great way to increase self-esteem and feel more normal while waiting for your natural hair to return. A lot of options to choose from: You can choose a wig by length, color, texture (real human hair or synthetic), and quality (remy vs virgin hair). Well-known celebrity hair stylist such as Tabatha Coffey (who is known for ‘Tabatha Salon Takeover’ Reality Show) even offers a collection of fashion wigs and extensions. Additionally, whether you are looking for hair pieces to cover thinning hair or a full wig to cover the entire hairline, there are a variety of ways for you to wear a wig from clip-ons, interlocking or straight combs, to weaving/bonding (click here to see different options). 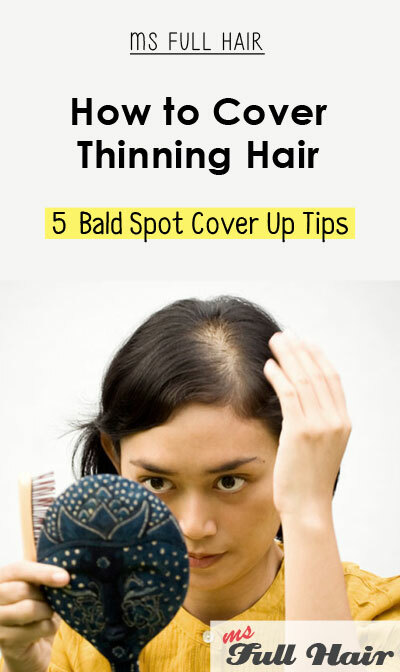 The 5 bald spot cover-up tips above talk about different methods for how to cover thinning hair. As you can see, none of them are permanent fixes to reverse your hair loss, but they can provide a quick solution (such as Toppik hair fibers) to put more attention on your beauty than your thinning hair.